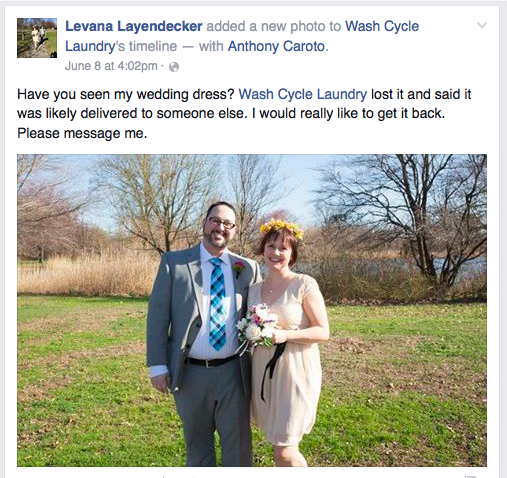 This is the story of how WashCycleLaundry lost my wedding dress and then sent me a ridiculous pittance of a check to try to appease me. On May 27, I scheduled a pick up with WashCycle Laundry. I was a first time customer. The original time I requested was immediately changed because though their web site said it was available, it was not. So, I scheduled for a time later that day and cyclist was late. I got a confirmation email that my laundry would be dropped off back at my home on May 29, but I got a call that day that they were running late and needed to bring it to me the following week. The following week, I got another call that they were really backed up and needed another day. On June 3, they finally informed me that my laundry was lost and they asked me for an inventory of what was in the bag. At first it took me a minute to remember what I had in that bag, but soon enough I came to the horrible realization that my wedding dress was in that bag. Then I spent the next week following up with them every day and begging them to let me come to facility and look for it myself. They refused and on June 8, over the phone they offered to pay me $350 for my items. I refused and asked to speak to a supervisor. I think Mike or Gabe needs to get involved. It’s not a marketing/customer service issue so much as a refund/replacement one that is more on the business side. You did all you could. It seems like no matter what we do she will not be satisfied which is totally understandable but now she don’t want to speak to me anymore and is asking for my Supervisor. My concern of course is social media. P.S. Want to tell the world about us? Check out Wash Cycle Laundry on Yelp! Needless to say, I was not intended to receive that email. And it seemed pretty clear that their main concern was that I would go to social media. And it was also clear that they were done looking for my dress. So, I felt I had no choice but to post a review on Yelp, Facebook, and Twitter. That got their attention and that night the CEO of the company emailed me. I asked him to call me and he assured me that he would take control of the situation. They did keep me updated for two weeks on their progress, but still would not let me search or inspect the facilities myself. I don’t know they actually did any of the things that they reported to me, but it did seem like they made an effort. Then on June 17, I got a long letter from the CEO, Gabriel Mandjano, which professed to be an apology, but really was a long justification of how they really are a good company and just made this one mistake. Their Yelp reviews would beg to differ. Our terms of service, which we created by surveying the practices of over a dozen Center City dry cleaners, provide for reimbursement of up to 10x the price we charge to clean each item. We’ve calculated the total amount based on the inventory you’ve supplied us and enclosed a check with this letter. I got that check a week later, and it was for $300. That is $50 less than what they offered me a few weeks ago. First of all, I want to say that no amount of money could make up for what I lost. My dress was not particularly expensive, but it was special to me. When I discovered that it was lost, all I really wanted was for them to find it. Not only did they not find it, but sending me a check without even talking to me first is just insulting. The truth is that I just want my dress back. I know that someone has it. If the wedding photos get circulated more widely, maybe someone will recognize it and return it. If you have any leads, feel free to contact me and I will come get it–no questions asked. Finally, I just want to add that I am very supportive of sustainable businesses, but there is no excuse for bad management on this level. I can’t support a company with my business that is this poorly run. My husband and I were featured in Grid Magazine’s sustainable weddings issue for supporting local businesses. My biggest regret is that I didn’t bring my dress to my trusted local cleaner, Linn Cleaners, on the corner of 15th and Jackson. They are an excellent business where they know my name, treat me with respect, and take care of my clothes. I am ashamed that I was wooed by WashCycleLaundry‘s marketing. I will never stray again. 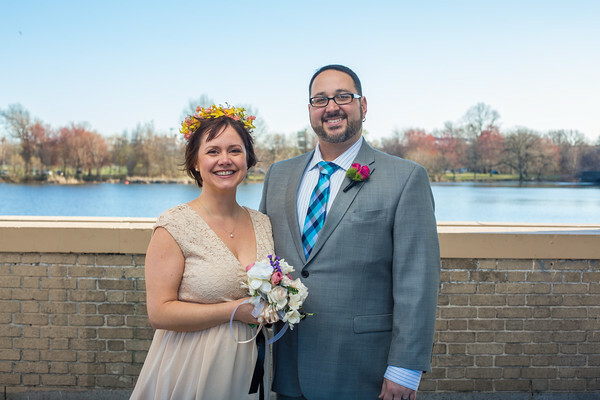 « Wedding photos are here! What a horrible company! I’ll share. This is awful. I can’t believe how they handled your situation. I shared this in hopes that your dress is found. Can I also add, you might want to blur out their bank information. Bank fraud is huge these days. Thanks. Will do on the check photo.